Leading Manufacturer of diamond earring and silver diamond earrings from Jaipur. We are indulged in manufacturing and supplying wide gamut of Diamond Earring. These can be worn with casual as well as traditional attires thereby, giving wearer a fashionable look. The stones and other embellishments used in crafting the earrings are of superior quality procured from the authentic sources. We have been offering the earrings in varied designs and sizes. We have emerged as the foremost manufacturer and supplier of Diamond Earring. Designed by our skilled professionals in line with latest market norms, these earrings are available in various colors, designs and sizes. The offered earrings are designed using the best quality basic material and ultra-modern technology in sync with industry norms. 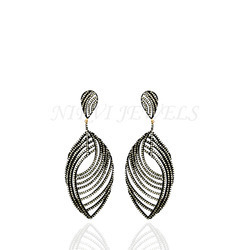 Our provided earrings have an extravagant look which offer glow to the face. We are indulged in manufacturing and supplying wide gamut of Colorful Designer Earrings . These can be worn with casual as well as traditional attires thereby, giving wearer a fashionable look. The stones and other embellishments used in crafting the earrings are of superior quality procured from the authentic sources. 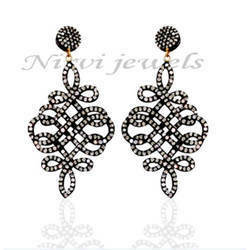 We have been offering the earrings in varied designs and sizes.